Brisbane time is 24 Apr 2019, 10:57:10 PM. 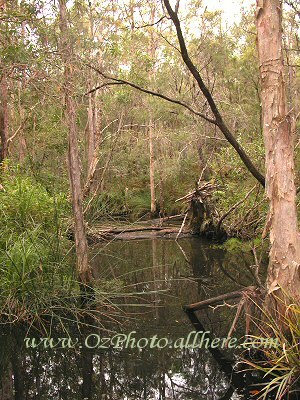 A typical view of the Aussie bush with Swamp Ti-trees and gum trees crowding the waters edge. If you see an image here you can click on it to view a full sized segment of this photo. Along with the dimensions (pixel size) of the photo, this will assist you in determining if this photo is suitable for your purposes. If there is no image (yet), please contact me and I will be happy to provide an actual pixel segment. Note that if you order digital images you only need order and pay for 1 copy of each. You can then use that copy as many times as you wish. * Please see Copyright / Image Use page for full details. Images are not to be resold as prints, digital images, greeting cards or calendars. Limited licence permits the images to be used in a modified form and published for resale eg. invitations or jigsaws to be sold. Digital versions available via email (small quantities). Copyright statements will not appear on your printed photo or digital image. Digital images must not be resold in any form - ie. as a digital image or print.